Face-to-face communication for small businesses has become a challenge in 2019. Individuals scurry from place to place: meeting customers while on the road traveling, preparing reports for management, and trying to find a few spare minutes for family activities. When they connect with colleagues, employees do not want to spend time downloading apps, changing system settings, or troubleshooting problem lines, common occurrences with many collaboration solutions. 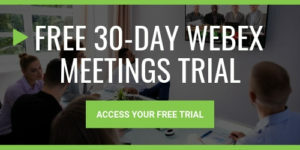 Cisco Webex Meetings was built for today’s harried professional. The solution supports all popular mobile devices, including your favorite one. To join a conference, you do not need to input a long telephone number or obscure access codes. Instead, a few taps on your phone and you are ready to go. If you are the host, easy to use prompts enable you to blast invites to coworkers and guests, like important customers and key partners. Meetings are as intimate or as big (the system supports over 40,000 people) as needed. The system supports three types of events. Cisco Webex Events features interactive webinars with HD video and broadcast-quality audio. Cisco Webex Webcasting supports large scale virtual events, such as a stockholder presentation. Cisco Webex Training is built for online learning and features breakout sessions, testing, and automated grading. The system delivers enterprise-grade performance at SMB pricing. If problems arise during a telecast, Cisco Webex Support features live chat and remote desktop control so support personnel see what you see. Increasingly, work is done online, in groups, and in an ad hoc manner. Cisco Webex Teams supports today’s virtual teams with five important functions: chat, messaging, whiteboarding, scheduling, and file sharing. The group messaging function enables members to send important information via direct and team messages boards, where they are acted upon immediately or flagged for follow up later. The board becomes the group’s record keeper: tracking conversations so all members understand the workflow. When brainstorming is needed, the whiteboard allows you to draw on any device, including your phone. The system supports input from a variety of sources, including Google Docs, Box, Trello, Zendesk, and Twitter. Files are shared by a few button clicks. When the work piles up and the boss wants the market reports ASAP, searching is quick and easy because the files are well organized. Company secrets are protected because the communications are secure. End-to-end encryption ensures that outsiders do not access any of the materials created (messages, documents and whiteboard drawings). The system keeps teamwork spaces private. Input from partners or customers is clearly distinguished from employees’ suggestions. Sometimes, a smartphone or a laptop is not rich enough, so employees need other devices to share their thoughts. Cisco Webex Room series includes intelligent whiteboards, video conferencing solutions, and telephones. These add-on devices enable your team to communicate and create in real time. All Cisco Webex Devices are integrated with Cisco Webex Meetings and Cisco Webex Teams. Drop the intelligent hardware in, turn them on, and off you go. Set up requires a few quick clicks. Cisco Webex Board replaces yesteryear’s paper easels. The sleek wireless whiteboard, video conferencing, and audio conference system enables individuals to annotate shared content. A powerful 4K camera captures high-resolution, wide-angle room images. A 12-microphone array delivers crisp, clear audio, automatically amplifying and modulating voices so that all meeting participants are clearly heard. Noise suppression features reduce meeting disruptions. Cisco Webex Room solutions are smart video conferencing systems that work on premises or in the cloud. Content is displayed in 4K resolution on up to three screens, a needed convenience when data needs to be compared. The solution is smart. It wakes up when you walk into the room and is controlled by your mobile device. Cisco Webex Room systems count meeting participants and provide usage and resource planning analytics. The system features automatic screen integration. Cloud has become popular because businesses offload the challenges found in maintaining computer systems to a third party but gain more features. Cisco Webex Calling is a cloud communications system that features shared lines, hunt groups, hold, resume, pickup, forward, do not disturb and transfer functions. The solution’s virtual receptionist greets all inbound callers and offers personalized voicemail for every user. The product features dashboards that simplify management. SMBs need help to get the most out of these solutions. At IP Consulting, we work closely with small businesses to find the right solutions for their needs and their budget. We learn about your business goals and objectives, and we propose collaboration solutions designed to achieve your goals in company communication. We stay with you through deployment to adoption, ensuring your systems meet your needs. As a trusted Cisco partner, we’re experts in their reliable, cost-effective solutions.